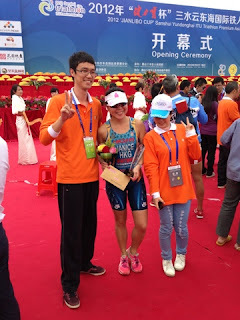 We are back from SanShui ITU Triathlon, bring back the trophies, price money, PB and great result, Congratulating Michal crowned AG champion, Janice AG 3rd, Gigi AG 5th, big thanks to TriHK close coordination and great hospitality of SanShui volunteers! It was a beautiful weather on race morning, sunny, 15C air temperature and 21C in the water, around 60% humidity, and blue sky, perfect racing condition! Very big difference from the previous rainy and cold race day for elite. Pre-race announcement confirm it’s NOT allow for wetsuit that help for those on/off decision to put on the wetsuit. · Stay optimistic for all weather conditions, we prepared for the cold day but who know it turned sunny? GuangDong style is going global! 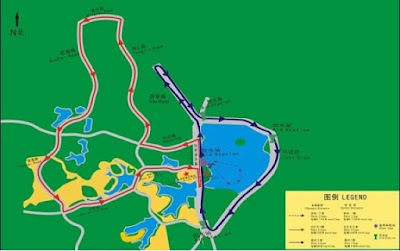 The race setup is exactly aligning with high ITU standard, blue carpet, big LED screen live coverage, 5 buoys swim course with floating pontoon to dive-in, very wide bike course you only need to slow down on 1 turning point, well defined marking you just feel like racing in any of the World Champion series. This race is the event of the whole SanShui City, they mobilized large number of volunteers from the schools and university to station in race registration, greeting and sending off triathletes, cheerleading at every 10m on bike/run course, handing out full bottle of waters, you got the same level of experience compare to fully commercialized Ironman races, given that only RMB80 for registration, you eventually forgave some of the chaos during registration. From the start list we are one of the big continental team of 17 athletes however we only have 9 standing on the start line because of difference reasons I received. We are lucky for no penalty charge for hotel and race entry just for this time. 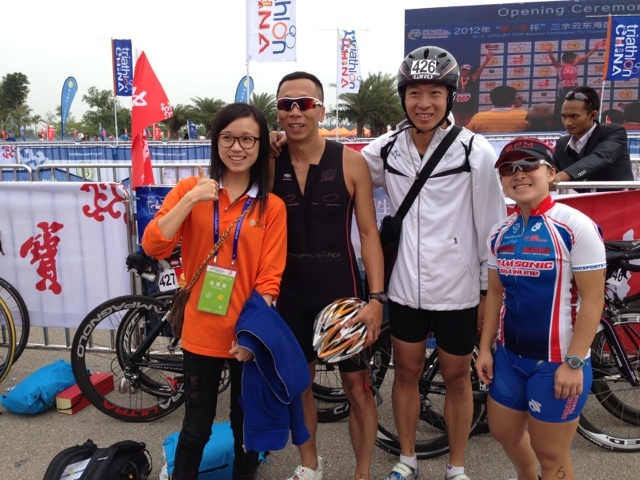 We will go again next year, and we will need strong commitment from everyone to protect our reputation as age-grouper team of Sonic from Hong Kong China. 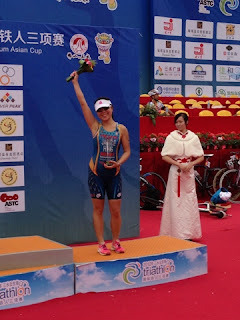 Couple of vignettes to share about racing in China. It’s a new sport there. 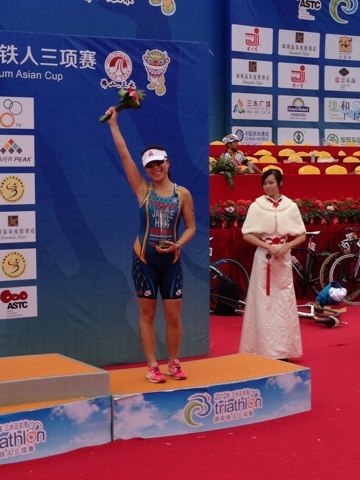 As with all other aspects, racing in China will take on China characteristics. Sometimes in very humorous ways. 2) While Philip and I were getting ready in transition area, guy next to me had a swim top on. On it he had pinned his race number on front and back of the shirt. Obviously not aware that you don’t need a number for the swim and that the pins could potentially jab someone’s finger during the wave starts. So Philip kindly gave him a race belt and showed him how to use it. 3) Another guy saw me putting on sunscreen so he comes excitedly over to ask for some. After I squeezed some into the palm of his hand, he proudly announced that this is the first time he has used this stuff. You have to realize this guy is in his 50’s and his sun-baked face with creases showed it. 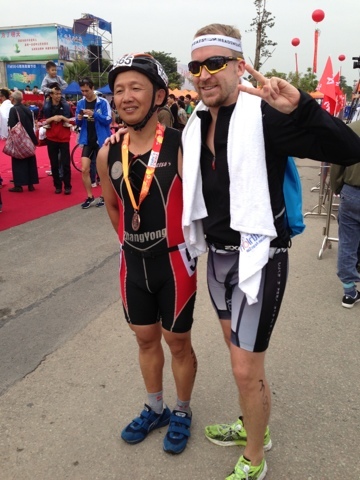 4) On my bike, there was a guy who passed me on every incline for 2 loops. During the straight-aways and down slopes, I passed him with ease in my TT position. When you first see this guy, he is on an ordinary bike. Ok it does not have a basket, but it has clips and he is wearing sneakers. But on the uphills, he is standing and really putting his back into it. I could hear him huffing and puffing behind me until he passed me. 5) During the start, we were lined up according to our race number. Yes, we stood in order of our number. You can’t even imagine doing this in HK, or for that matter, anywhere else in the world! Guy next me was asking all kinds of questions while we were watching the swim starts. Turns out the only other race he has done—ever—was the Shanshui race last year. 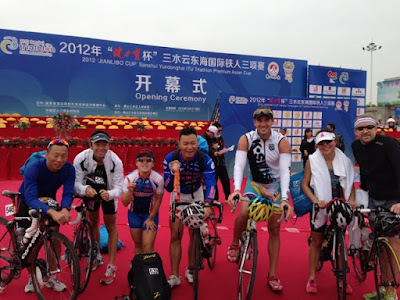 Anyway, we are in the early stages of Tri’s in China. Since it is an Olympic sport, it will undoubtedly grow large over time. With 1.3 billion people, expect some tough competitors to emerge in the future. Supplementing Julius' point 5 below, there were 11 people in Gigi and my age group, and the guy ordered and reordered us 4 times to line up in accordance with our race numbers (no. 631 to, er, 641) even though we had not moved since the first time we were told to stand in place and looked equally perplexed each time when Gi and I told him that no. 641 (a la Louise Wheeler) is not coming. I think he might have thought that he would have to write a report to each superior level on why he did not have a complete set of athletes. Another anecdote is that when I emerged from the the water, taking off my swim cap to enter into T1, there were lots of "It's a girl!" exclamations from the crowd as if I had just emerged from my mother's womb. I don't think I have seen so many "voluteers" along the course in a race, each cheered as enthusiastically as they were my own friends. 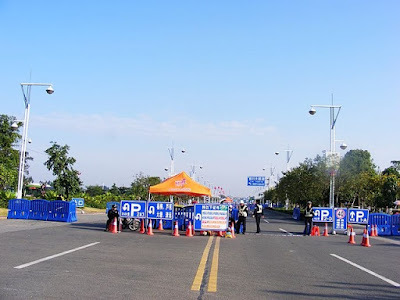 I had put "volunteers" in quotation marks as Gi would probably respond otherwise with her (somewhat ironically true) theory that everything over the weekend (including the blue sky on race day) had been paid, one way or another, by the government. This girl is one of the helpful volunteers for our group registration.